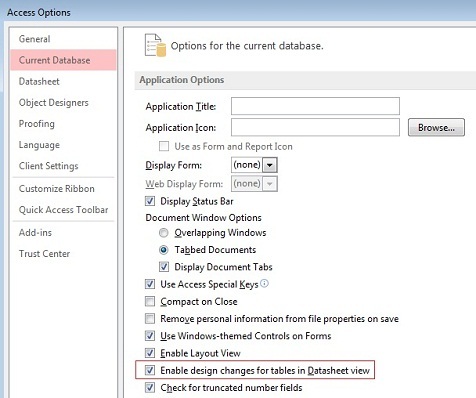 A feature in Microsoft Access 2007 or later lets people easily modify the structure of their tables without putting it into design mode. Simply add a column while viewing the datasheet. This makes it easy to change a table similar to the way people add columns to an Excel spreadsheet. However, this is not desirable if you created a database and deploy it to people who shouldn't be making structural changes to your tables. Let's see how to make this feature enabled. 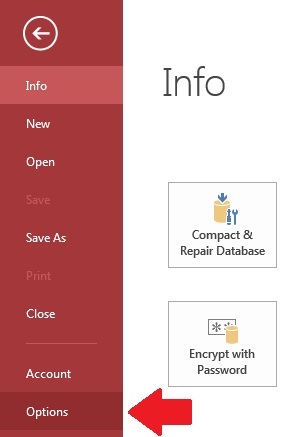 Click on Office button and then Access Options. This option should be turned off in applications you build for others. Having users accidentally or deliberately create, delete or rename fields can easily cause your application to crash. Changing a table's structure has implications for queries, forms, reports, macros, and modules that depend on those fields. After turning off this option and reopening the database, you'll see the right click menu on tables has more restricted options. The Add New Field column on the far right is also gone. This tip and other ways to ensure you create great Access applications are found in Total Access Analyzer.